Coming Soon to our Fleet! 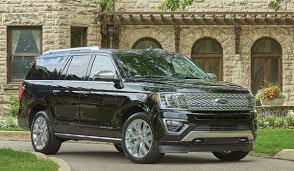 2018 Ford Expedition Max XLT Series The new Expedition is lighter and stronger than ever without sacrificing space or comfort. It has more than 40 new features that make the ample SUV not only safe but also incredibly driver-friendly. The ride can also be customized with Ford’s Terrain Management System, which offers a variety of drive modes for the best in handling and passenger comfort. Ford ups the game with quick cordless charging in the front console, which is the first vehicle in the OEM’s lineup to make this option available. Passengers can take advantage of the one of six USB ports for lightning-fast charging at every seat. And the view from any of those seats is a great one, thanks to an optional panoramic glass roof. With three rows of seating, plus easy access to the third row with tip-and-slide functionality, there’s plenty of leg room to keep everyone happy and relaxed for the journey. For over 25 years, BASE Limousine Service has provided chauffeured transportation for top Executives and Professionals in the Chicagoland area.